Ranking member of the House Transportation and Infrastructure Committee Rep. Peter DeFazio vows to crack down on unapproved airplane parts that pose a safety risk to the flying public. DeFazio’s renewed focus on bogus parts comes after an Inspector General audit called the Federal Aviation Administration “ineffective” when it comes to removing unapproved parts. The audit echoes a series of reports by the NBC Bay Area Investigative Unit that found thousands of unapproved parts sneaking onto commercial aircraft and manufacturers who continued to sell unapproved parts after receiving FAA sanctions. Investigative reporter Stephen Stock reports on a story that first aired Feb. 27, 2018. The Department of Transportation's Inspector General says the “FAA’s oversight of industry actions to remove unapproved parts (from the nation’s aviation system) is ineffective,” and the agency “cannot be assured that unapproved parts … no longer pose a threat to safety” for the traveling public. That OIG report has prompted ranking member of the U.S. House Transportation and Infrastructure Committee, Rep. Peter DeFazio, (D-Oregon), to vow to crack down on unapproved airplane parts that he says pose a safety risk to the flying public. The inspector general’s report echoes a series of stories by NBC Bay Area’s Investigative Unit that first aired in 2016. The Investigative Unit’s reporting found thousands of unapproved parts made their way onto and into the systems of commercial aircrafts. NBC Bay Area also found aviation suppliers and manufacturers who continued to sell unapproved parts even after receiving FAA sanctions. “We really need to pay a lot more attention to this. How parts are manufactured and tracked throughout their life and ultimately destroyed at the end so they can’t be snuck back into the part stream,” DeFazio told NBC Bay Area. Concerned about the FAA’s oversight or lack thereof, DeFazio was the one who asked the Inspector General’s Office to audit the FAA’s suspected unapproved parts program. The audit criticized the FAA for a lack of recordkeeping, management control, and inaccuracies in tracking unapproved parts. Officials at the Inspector General's Office aren't the only ones raising safety concerns about unapproved parts ending up in commercial airplane systems. Industry whistleblower Charles Shi, who worked for an aviation parts supplier for Boeing aircraft, believes the problem of unapproved parts is worse than the FAA acknowledges. Shi worked as a quality control inspector based in China, overseeing parts made for Boeing aircraft. During his inspections, Shi says he found that parts outsourced to another third party Chinese supplier were made with inferior materials that were not "baked" long enough to harden appropriately during production. “You need to bake the parts to get the hydrogen out of the parts. So the parts can still be solid with integrity. Otherwise the hydrogen goes into the parts that can make the parts thin and brittle so the parts can fail,” Shi told NBC Bay Area. The parts in question are components in a Boeing 777’s spoiler system, which allows an airplane to take off and land safely. Shi took his safety concerns to the FAA. According to documents from an FAA whistleblower investigation, officials confirmed that hundreds of parts used on Boeing 777’s were manufactured in violation of FAA standards and that documents were “fabricated” by a third party Chinese supplier to conceal the violation. Even so, the FAA still allowed Boeing to install the parts “as is.” Those parts remain on Boeing aircraft to this day. On March 14, 2016 Charles Shi filed a whistleblower complaint with the FAA alleging substandard materials and processes were used by a Chinese manufacturer to produce parts intended for Boeing aircraft. A spokesperson for Shi’s former employer, Moog Inc., said the parts in question were tested and determined to meet specifications. “There have been no reported issues with these parts. The FAA investigated and determined all necessary corrective actions had been taken,” the spokesman said. Read full statement from Moog Inc.
“A lot of our airlines have outsourced their heavy maintenance to overseas where, you know, one criminal could put in a part that's going to cause a critical failure in that plane. One terrorist could put in a part that intentionally is going to fail,” DeFazio said. FAA records analyzed by the Investigative Unit revealed incidents like these happen more often than the public is aware. Investigation reports and unapproved part notifications found more than 2,800 individual airplanes that had unapproved parts discovered on them since 2011, including on U.S. commercial air carriers. The NBC Bay Area Investigative Unit found thousands of instances where bogus and potentially dangerous airplane parts were surreptitiously installed on planes including major commercial airliners. 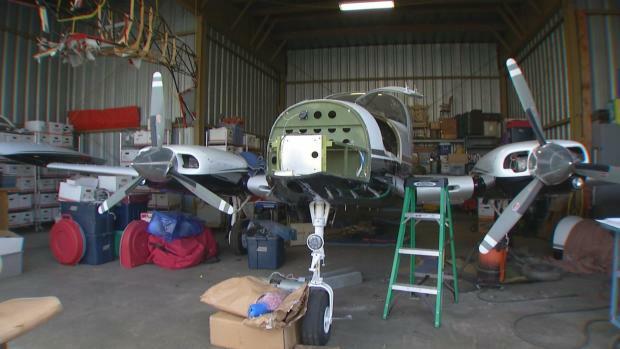 The Federal Aviation Administration sanctions repair shops and manufacturers who deal bogus parts, but records show that doesn’t always stop some companies from staying open for business. Stephen Stock reports on a story that aired on May 17, 2017. Former Acting FAA Administrator Joseph Del Balzo believes the agency could do more to root out bogus parts from the industry. FAA Acting Administrator Daniel K. Elwell told the Investigative Unit his agency is reviewing the inspector general’s recommendations while also touting his agency’s safety track record. “There has not been a commercial passenger fatality in the U.S. in nine years. It's an amazing safety record that is borne from a collaborative approach to safety,” Elwell said. As a former commercial pilot, Elwell said he does not believe unapproved parts pose a safety risk to the flying public. “I've been flying for longer than I care to admit and was recently checked out again. So if I had a concern about it, I wouldn't be flying,” Elwell told NBC Bay Area. Meanwhile, DeFazio said he is working to strengthen regulations that would allow investigators to more easily identify legitimate aviation parts.